In this work we consider (hierarchical, Lagrange) reduced basis approximation and a posteriori error estimation for elasticity problems in affinely parametrized geometries. The essential ingredients of the methodology are: a Galerkin projection onto a low-dimensional space associated with a smooth “parametric manifold”—dimension reduction; an efficient and effective greedy sampling methods for identification of optimal and numerically stable approximations—rapid convergence; an a posteriori error estimation procedures—rigorous and sharp bounds for the functional outputs related with the underlying solution or related quantities of interest, like stress intensity factor; and Offline-Online computational decomposition strategies—minimum marginal cost for high performance in the real-time and many-query (e.g., design and optimization) contexts. 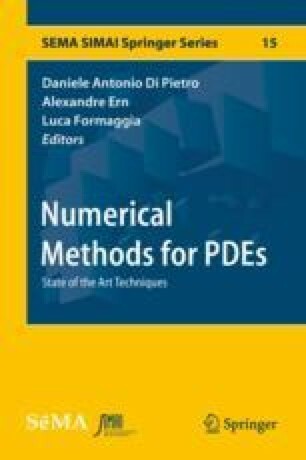 We present several illustrative results for linear elasticity problem in parametrized geometries representing 2D Cartesian or 3D axisymmetric configurations like an arc-cantilever beam, a center crack problem, a composite unit cell or a woven composite beam, a multi-material plate, and a closed vessel. We consider different parametrization for the systems: either physical quantities—to model the materials and loads—and geometrical parameters—to model different geometrical configurations—with isotropic and orthotropic materials working in plane stress and plane strain approximation. We would like to underline the versatility of the methodology in very different problems. As last example we provide a nonlinear setting with increased complexity. We are sincerely grateful to Prof. A.T. Patera (MIT) and Dr. C.N. Nguyen (MIT) for important suggestions, remarks, insights, and codevelopers of the rbMIT and RBniCS (http://mathlab.sissa.it/rbnics) software libraries used for the numerical tests. We acknowledge the European Research Council consolidator grant H2020 ERC CoG 2015 AROMA-CFD GA 681447 (PI Prof. G. Rozza). In this section, we denote Ei, i = 1, 3 as the Young’s moduli, νij; i, j = 1, 2, 3 as the Poisson ratios; and G12 as the shear modulus of the material. For both of the following cases, E = E1 = E2, and ν = ν12 = ν21. must be required in order to yield a symmetric [E]. must be satisfied, which leads to a symmetric [E].